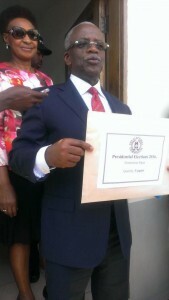 Presidential aspirants have today started picking nomination forms at the Electoral Commission. The first batch included former premier Amama Mbabazi and former Makerere University Vice Chancellor Prof Venancious Baryamureba. These and six others were handed nomination forms after paying the mandatory non-refundable Shs. 8 million. Speaking to journalists shortly after, Mbabazi says he was all set to resume his consultative meetings in preparation for the presidential race. However, the NRM Treasurer, Rose Namayanja says it’s too soon for Mbabazi to make such a move. She has told KFM that the NRM legal team is still studying his behavior and will soon come up with a position. For former Makerere University Vice Chancellor Venanious Baryamureba his focus will be on improving services. The other presidential aspirants are Dr. Deo Lukyamuzi and businessmen Fredrick Kunya & Joseph Mwambazi, Moses Wataba and Joshua Clinton Kaswabuli of the Revolutionary People’s Party. The electoral commission’s Public Relations Officer Jotham Taremwa says the aspirants now have to look for 100 signatures seconding them from across the country. He says the entire exercise will end on 21 of September 2015. Nominations for presidential aspirants are set for the 5th and 6th-October- 2015 and 2nd and 3rd of December 2015 for parliamentary.